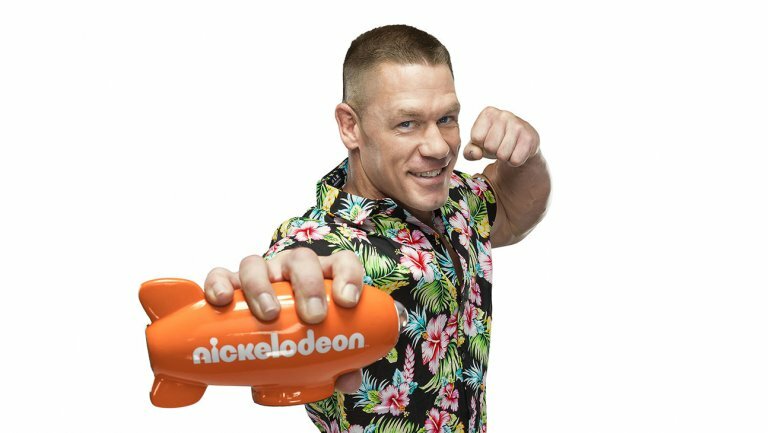 Indeed, Cena will host Nickelodeon’s annual Kid’s Choice Awards on March 11, just a few weeks before Wrestlemania. But it’s seemingly becoming less and less about wrestling for Cena. We’ve always known he had major crossover appeal. Every bit as much as Hulk Hogan or Steve Austin. Perhaps even the Rock. That’s one of the things WWE looks for in their top guys. But in 2016, the demand for Cena outside the squared circle was higher than ever. Things don’t seem to be slowing down, either. In the last several months, he’s had critical opportunities to define the John Cena “brand” for mainstream America. 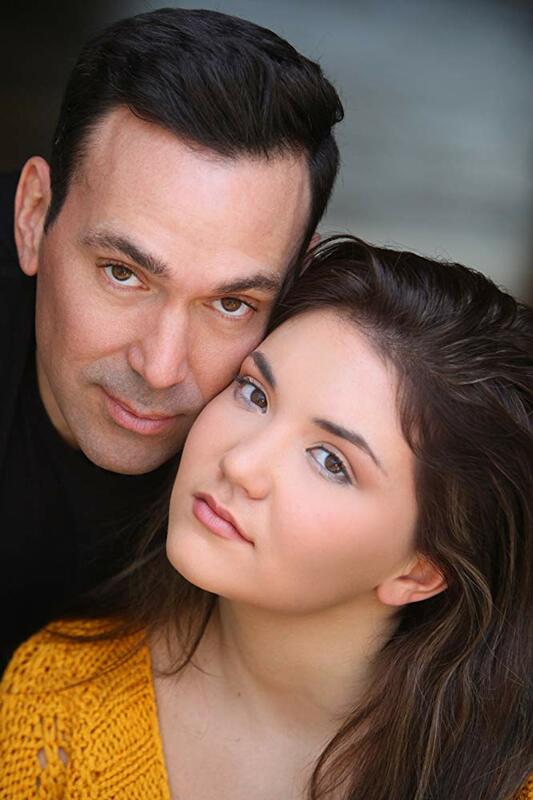 Consider all the different demographics he’s reached via ESPN, the Today show and Saturday Night Live on NBC, Trainwreck with Amy Schumer, American Grit on Fox, and now Nickelodeon. Simply put, he’s everywhere. For WWE, this is good news. 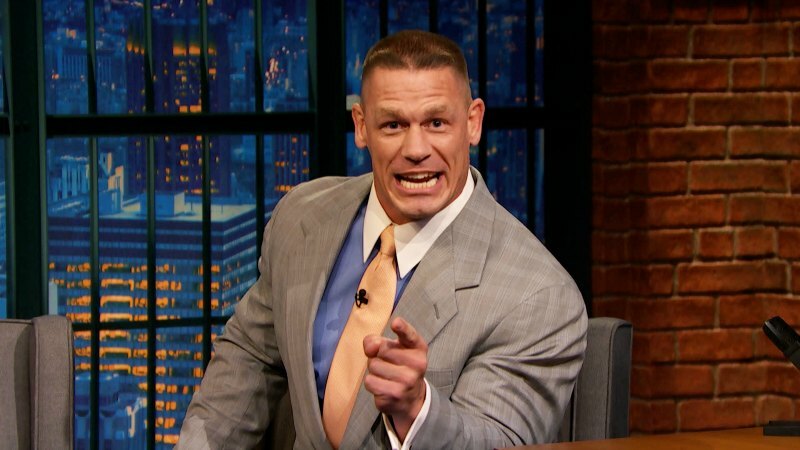 Yes, we’re bound to see far less of Cena on their TV shows. But he’s also one of the best ambassadors they’ve ever had. He’s handsome, charismatic, and legitimately entertaining when given the right material. He’s a guy you would want synonymous with your company. Eventually, the Rock outgrew WWE. The Dwayne Johnson brand became as big, if not bigger, than the company he wrestled for. At this point, WWE is still very much woven into the fabric of the John Cena brand. So until he leaves the nest on a more permanent basis, what’s good for Cena is good for WWE. Randy Orton def. Luke Harper. Bray Wyatt hits Sister Abigail on Harper after the match. Nice match. We may now have one less Wyatt Family member. WWE has tried to break Harper out on his own before. He even got a brief Intercontinental Title reign out of it. But he wasn’t able to carve out a distinct identity for himself. He was essentially a drifting Wyatt Family member. 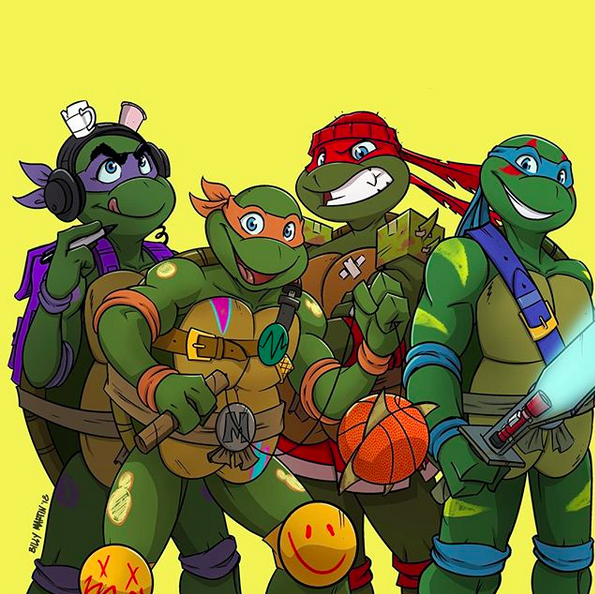 That’s why it felt so right when they eventually put the group back together. If this is another go at a singles run for him, they can’t repeat the same mistakes. Mickie James explains her actions as La Luchadora. She and Alexa Bliss lay out Becky Lynch. I love Mickie. I really do. But when she started rattling off her resume, it screamed “scripted promo.” Most of this stuff is scripted, obviously. But that just made it painfully obvious. I do appreciate her spicing up the delivery, though. Her character motivation makes sense. With all this talk of a women’s revolution, she feels forgotten. And I’ll admit, I got a little chill when Becky’s music hit, and she talked right over it. “Don’t cry about last week, honey! Get in this ring and I’ll give you something to cry about!” Damn! One minor complaint: When Becky was down in the ring, Alexa gave her a little kick in the side. She didn’t even register it. Maybe lay that in a little more next time. But overall, some pretty good stuff here. Carmella takes James Ellsworth shopping for a new wardrobe. These talking segments still aren’t Ellsworth’s strong point. But Carmella’s got a lot of charisma, and I appreciate the idea. It’s always good to break up the monotony. I’ll admit, I chuckled at Ellsworth wearing a turtleneck. Mojo Rawley wins a 10-man Over the Top Rope Challenge to earn a spot in the Royal Rumble Match. Mojo Rawley caught a bad break when Zack Ryder got hurt. It’s cool that they’re testing the waters with him. But who is this guy? All I really know is he was Zack Ryder’s tag partner in NXT. This is the first time we’ve seen Heath Slater in awhile. They need to find something for him to do. The team with Rhyno has run its course. But he can still contribute as a single. They had Baron Corbin out there on commentary. He’s improving, but the Earth didn’t move for me on this one. AJ Styles calls out John Cena. It found it hilarious that AJ talked about his placement on the Royal Rumble poster. I actually saw a few Twitter trolls complaining about that. It’s not entirely unjustified. But it’s a multi-man Royal Rumble poster that has the four biggest stars (Undertaker, Goldberg, Brock Lesnar, and Cena) in the front. Even the mighty Roman Reigns didn’t make the front row. Get over it. What can I say? I was tickled. Other than that, this was pretty much your standard Cena vs. Indy Guy promo. Not thrilled to see AJ stunned speechless at the end. Especially since there’s a good chance Cena’s walking out with the belt on Sunday. Dolph Ziggler def. Kalisto. Apollo Crews saves Kalisto from another chair attack by Ziggler. Loved Kalisto dodging the clothesline with a backflip. That’s pretty much all I can say about this one, as it ended so quickly. I imagine we’ll see Ziggler vs. Crews sooner than later. Unless they want to do it at Elimination Chamber. But that seems unlikely. They’ll probably need Dolph for the chamber. Naomi reemerges, places herself in the hunt for the Smackdown Women’s Title. Happy to see Naomi back on television. She’s clearly been hungry for awhile now, and she’s got so many athletic gifts. She deserves her shot. Dean Ambrose def. the Miz in a Lumberjack Match to retain the Intercontinental Championship. On the infographic they showed when Ambrose came out, he had two accomplishments listed: “Founding member of the Shield” and “Defeated the Miz for the Intercontinental Championship.” We’ve been getting Shield mentions every week on Raw, and Smackdown hasn’t been shy about bringing them up either. WWE really wants the Shield near the front of everyone’s mind. I imagine that’s because they want some of those fond memories to rub off on Roman Reigns. But it also doesn’t hurt to plant seeds for their inevitable reunion. I was pleased to hear “Let’s go Ambrose!” chants during this match. 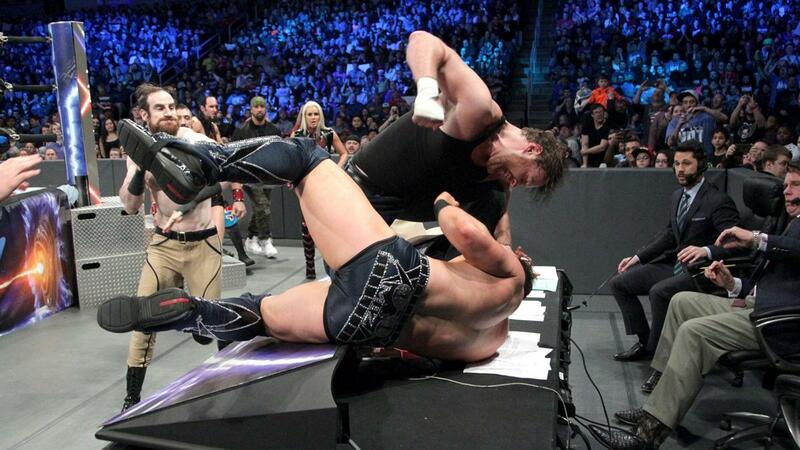 Ambrose was starting to hear boos when he was programmed with AJ Styles. I’d like to think that had more to do with the love fans have for Styles than any disdain they developed for Ambrose. He’s such an eccentric talent, and one of my favorite guys to watch. 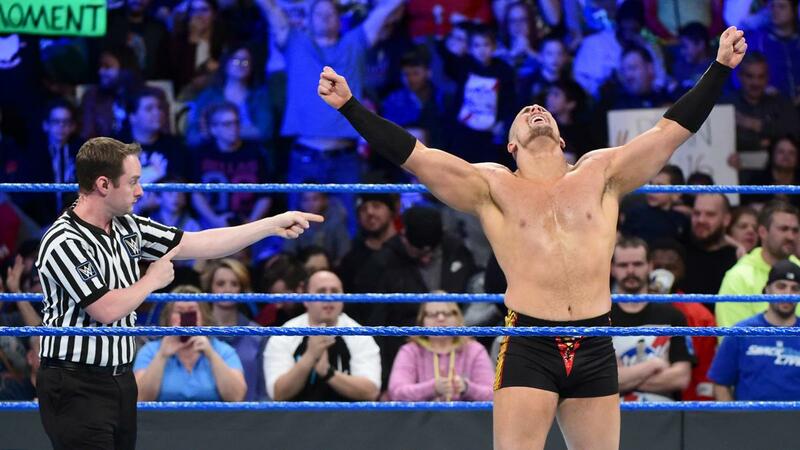 This entry was posted in Wrestling and tagged #SDLive, AJ Styles, Alexa Bliss, Baron Corbin, Becky Lynch, Bray Wyatt, Carmella (WWE), Dolph Ziggler, Heath Slater, James Ellsworth, John Cena, John Cena Saturday Night Live, John Cena SNL, John Cena vs. AJ Styles, Kalisto, Kid's Choice Awards, La Luchadora, Luke Harper, Lumberjack Match, Mauro Ranallo, Mickie James, Mojo Rawley, Naomi (WWE), Nickelodeon, pro wrestling, professional wrestling, Randy Orton, Rob Siebert, The Today Show, The Wyatt Family, WWE, WWE Royal Rumble, WWE Royal Rumble 2017, WWE Smackdown, WWE Smackdown Live, WWE Smackdown Results on 01/25/2017 by primaryignition.